Add a touch fun to the nursery or play room with Trend Lab's colorful Wall Clocks. 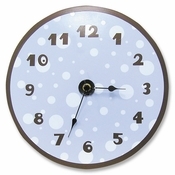 This darling clock coordinates with our Crib Bedding by Trend Lab Baby. NOTE: AA battery not included.